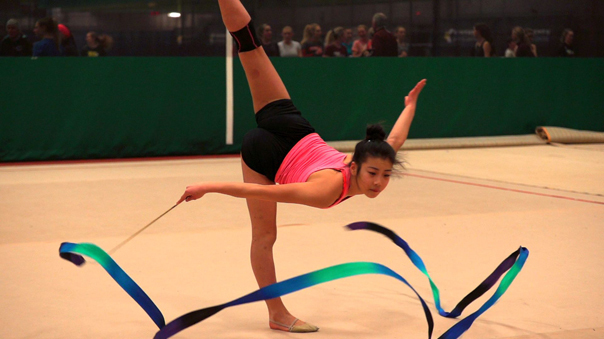 Last year Lindisfarne Productions was approached by Aisulu Abdykadyrova, current president of the Edmonton Rhythmic Sport of Gymnastics Association (ERSGA), to create a short documentary video about the club and it’s 40 year legacy in Edmonton. Lindisfarne Productions spoke to Aisulu, past president Barbara Miller, Head Coach Judy Berecz and her daughter and Assistant Head Coach Judy Martens about the history of the club in the city and the province, and it’s evolution as one of the most competitive and well-recognized clubs in the Rhythmic Gymnastics world. Lindisfarne Productions also spoke with former ERSGA gymnasts Anna Pavlyshyn, Amanda Greenwell, Cassandra Smale, and Hannah Perry about the impact the club had on their lives: their drive, their achievements, and of course the many strong relationships they built along the way. It was amazing to hear from the many accomplished women who have emerged from the club and see first hand the impact the club has had on them, the sport, and Edmonton and the province as a whole!